As a small business owner myself, I am AMAZED at the number of businesses that either don’t have a website, or have one that is very outdated and not user friendly. What’s even more surprising is that 28% of US small businesses and roughly 42% of Midwest small businesses don’t have a professional website. Like many small business owners, you may think that your business won’t benefit from having a website or that it isn’t within your budget. However, based on the statistics, this can’t be further from the truth. It doesn’t matter what type of business or organization you own or are a part of, if you want your company to thrive, a professional website is a necessity. 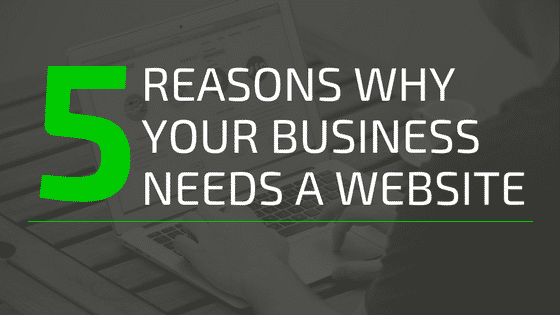 To help you understand the importance of showcasing your business online, I’ve created a list of 5 reasons why your business needs a website. A website is the face of your business or product. You know the saying, don’t judge a book by its cover. Well, consumers judge businesses based on their appearance and how they are showcased. For example, if you were shopping downtown and walked past a store that looked old, dark, and outdated, would that spark your interest to go inside? Maybe…but you might keep walking and find a store that is more intriguing. This is the same for a website. Customers might not realize that your business exists without putting a “face” to the brand name or company. You might have a website, but if it is outdated or difficult to navigate, customers will quickly leave your site and might never return. Having a professional website will give your business instant credibility and will drive traffic your way. When you have some time to spare, check out the website we did for a non-profit located in Manitowoc, WI, Painting Pathways Clubhouse. They significantly impact their local community and those with mental illnesses, and came to us for assistance since they wanted to showcase their services online in a professional manner. Their new website gives them instant credibility and will allow them to increase membership numbers as well as donations. Using a phone book to look up a telephone number for a business is a thing of the past. Consumers no longer look through the yellow pages to search for products or services, they use their cell phones or laptops and search through Google. It is vital for your business to appear in Google search results when potential customers are searching for a product that you sell or service that you offer. If your business does not appear in search results but instead, your competitor does, this will drive traffic away from you. Having a website that is optimized for search engines, also known as SEO, can significantly increase your online business and offline foot traffic, ultimately leading to an increase in sales. Please check out the statistics below. of searches for something nearby results in a purchase. of local searches made on a mobile device lead to a store visit within 1 day. Your website will be one of your most valuable marketing channels. By investing in an affordable professional website you will be able to reach customers that are looking for your specific products and/or services. Since they are searching for the services you offer, they are most likely ready and eager to buy! Roughly 78% of local-mobile searches result in an offline purchase. Not only do you reach customers that are ready to purchase your products or services, you have the opportunity to capture these customers through lead capture techniques. What is lead capturing? Lead capturing is the process of collecting email addresses on your website through a newsletter or a lead magnet. Once you capture a potential customers email address, you have the ability to market your products or services to them and build repeat business. Webrooming is the process of searching for products online and then visiting a store to make a purchase. It is the opposite of showrooming, which can be detrimental to main street businesses. Many small companies go out of business because consumers will use retail stores to look for products and then go online to purchase them from the cheapest possible outlet. Showrooming is inevitable and there will always be consumers that will do it, but this can be offset when you capture webrooming customers. In order to capture customers that webroom, you need to have a professional website or e-commerce store that showcases your products. Consumers will be able to see what you offer online and then visit your store to purchase the product directly from you. A professional website can showcase your brand, from the story behind your business to the message that you want your brand to portray. A professional web designer can implement the colors, images, and theme that aligns with your business. Web by Wyatt can help you build a brand that is recognized, leads to loyal customers and repeat buyers, and can help improve your customers experience both online and offline. …Does your small business need a professional website? Yes! Contact us today to see how we can help you! Wyatt is the owner and founder of Web by Wyatt and Wyatt Bicycles. He is passionate about biking, website design, entrepreneurship, teaching others about his experiences, seeking out adventure, and loves a good craft beer.